Which Big 10 East teams play the best out of conference schedules? With less than a month until the college football season begins, it’s time to look at the nonconference schedules of the Big Ten East teams. This will quite possibly be the best division in college football, and certainly the most top-heavy. The division has four teams that could be possible Playoff contenders, and they will be graded accordingly. The Hoosiers open the season with a recruiting trip to Florida. FIU has been an up-and-down program in recent years, and they are not always a total cupcake. I always say that my favorite thing in college football is nonconference games between equal-caliber Power 5 teams. That’s what we get with Indiana and Virginia, and major props to both teams for playing this. Ball State has fallen hard since its short peak under Brady Hoke. It’s in an-state cupcake for Indiana, who probably needs to win all three nonconference games to have any chance at a bowl. I’m okay with this. Indiana put together a good schedule. It’s a very strong mix of what the program needs to try to go bowling, along with a good Power 5 game. It’s nothing super-special, but there’s nothing to knock the program on either. Last year Maryland opened the season with a good road win over Texas. This year they get their home game in nearby FedEx Field. Maryland’s season derailed somewhat after losing two quarterbacks, but this game will show where D.J. Durkin has the Terrapins to start 2018. Maryland doesn’t have the biggest home stadium, but it’s nice to see the Terrapins willing to travel. It’s not like Bowling Green has a huge stadium or like too many recruits will come see this game. It’s always nice when P5 teams play on the road against Group of 5 schools. Maryland’s final nonconference game is against a good AAC team. I always like it when Power 5 teams play tough Group of 5 opponents, though it’s a little hard to see how this benefits Maryland. D.J. Durkin has been recruiting well and wants to break Maryland into the superfecta of Playoff contenders at the top of this division. This nonconference schedule is challenging and makes a bowl for Maryland pretty unlikely, but it’s bold and shows that the Terrapins are ready to view themselves as a contender. We’ll see if the talent and on-field product can match that. College football has missed this rivalry for a few years. It’s a good one and a great way to open the season. This game is by far the most expensive in Week 1, and for good reason. The Broncos may as well be a cupcake compared to Michigan, but they have had a few somewhat competitive seasons recently. The Mustangs looked like they were trending upwards under June Jones, but that was a long while ago. This program is nothing more than a cupcake with a sometimes-powerful offense at the moment. Michigan plays one amazing game, but the other two won’t really be challenging. It’s enough to skate by as a potential Playoff contender, and the division itself will provide plenty of big games to impress the committee. Still, this could have been a bit better. Michigan State opens the season on Friday night against a mid-to-bottom Mountain West team. There are worse openers, but not by too much. I would say that the Sun Devils are not necessarily a tough opponent for a Playoff contender, but Chris Petersen and Washington probably feel otherwise. Even with a trip out west, I would hope for a bigger game as a Playoff contender’s biggest. The Chippewas have managed to beat Power 5 teams the past few years, including some good ones. There are plenty of worse nonconference games than against a consistently solid MAC team. Michigan State’s schedule is decent, but it’s a far cry from recent years, where we saw a home-and-home against Oregon and last year’s game against Notre Dame. The Central Michigan game is not a bad one either, especially considering it comes right before a very difficult three-game stretch. The Beavers might be the second-worst P5 team this year (definitely ahead of Kansas, after which there’s a group including Oregon State), but Power 5 teams always have the ability to turn things around quickly. Just look at how Washington struggled against Rutgers last year. It’s much riskier to schedule P5 guarantee games than random MAC or Sun Belt teams. This “neutral-site” game is much closer to TCU, but will probably have more Ohio State fans. Still, it’s a nonconference game between preseason Playoff contenders. It should be great for everyone involved. The Green Wave has been trending in the right direction under Willie Fritz, but this team should still be pretty much considered a cupcake. This is a fine schedule for a Playoff contender. The game against TCU is a great one, but you’d still hope that a second game would be against a team a little more competitive than Oregon State. It’s been over a decade since the famous upset of Michigan, and App State has since become a consistently top Sun Belt team. 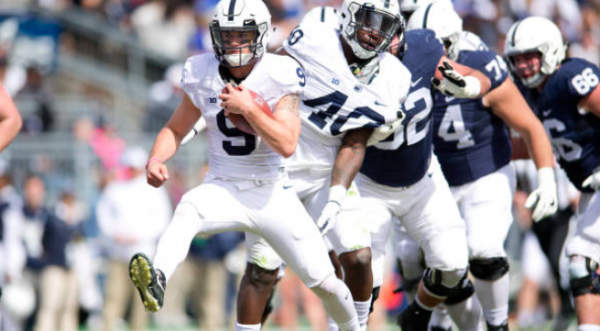 Penn State should win this game fairly easily, but it’s still a challenging opponent. The Mountaineers are no cupcake, especially if Penn State starts out flat. It’s a road game against a potential ACC contender. Pat Narduzzi hasn’t quite turned this Pitt team into the defensive monster that he ran at Michigan State, but he did upset eventual National Champion Clemson two seasons ago. Kent State is very far removed from the Dri Archer days, when this team was a few plays away from playing in a BCS game in 2012. Since then, this team has not won more than four games in a season. It’s hard to find a bigger cupcake right now. This schedule has no huge top-end game, but it has a good and difficult road game against a solid P5 team along with a game against a good Group of 5 team. This schedule may not make huge waves with the committee–which sometimes seems to care about the ranking of opponents instead of overall toughness of the games–but it’s a good one overall. The Bobcats are one of the worst teams in FBS. Rutgers managed to find a P5 road game that it should win. Honestly, I love this home-and-home between the two consistently worst P5 teams. Rutgers probably expected a third easy win from this game. Watch out, though. Lance Leipold has rejuvenated this Buffalo program. This game might not be as easy as anyone expects against Buffalo. Rutgers will need a bit of luck and at least one decent upset to make a bowl. Not going 3-0 in nonconference play will put a major damper on any hopes the Scarlet Knights have. This schedule gives them a good chance to actually go 3-0 and still give us some competitive games in the process.